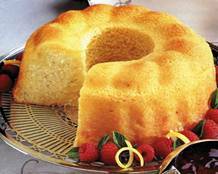 Serve this lovely lemon pound cake at an afternoon tea, or for a light dessert on a warm evening. Goes wonderful with a little whipped cream on the side. Heat oven to 325 degrees F (160 C). Beat sugar and butter in large bowl at medium speed, scraping bowl often, until creamy. Continue beating, adding eggs one at a time, until well mixed. Reduce speed to low. Beat, gradually adding flour, baking powder, baking soda and salt alternately with buttermilk and scraping bowl often, until well mixed. Add lemon peel and 1 tablespoon lemon juice. Continue beating until well mixed. Spread batter into greased and floured 12-cup Bundt pan or 10-inch tube pan. Bake for 55 to 65 minutes or until toothpick inserted in center comes out clean. Cool 10 minutes; remove from pan. Cool completely. *Note: If needed, substitute 2 teaspoons vinegar or lemon juice plus enough milk to equal 3/4 cup for buttermilk. Let stand 10 minutes. This recipe is excellent, everybody loved it. My grand-daughter and I made this yesterday, it was beautifully light, one of the nicest plain cakes we've made. Seemed a lot of icing, but it was fine. I can thoroughly recommend this recipe.